The Primary Treehouse: 100 Days Smarter! Each year I try to find something new to do. We have made pictures with our 100 items. We have glued 100 items onto hats that we have worn (I still have mine that I wear each year!). This year, I am going to try the 100's day crowns. I decided that I didn't just want to do stickers like I have seen on Pinterest. 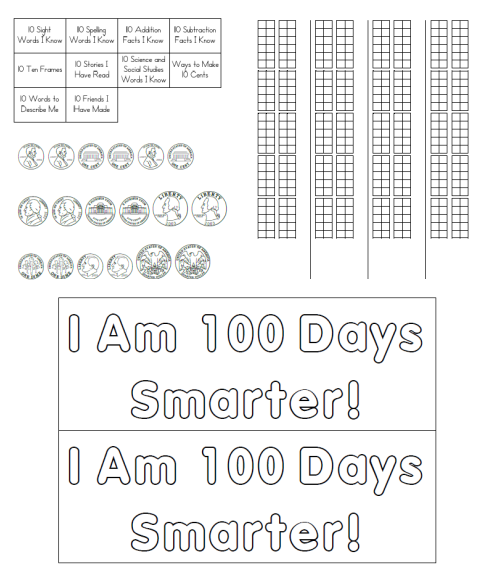 I want to actually have the kids show that they are 100 Days Smarter! So on each strip of paper, I am having the kids show 10 things that they know: 10 sight words, 10 pattern Spelling words, 10 addition facts, 10 subtraction facts,10 ten frames, 10 words to describe me, ways to make 10 cents, 10 stories I have read, 10 science/social studies words I know, and 10 friends I have made. If you want to use this one, you can find it here for free!